The deal has been hailed by finance minister Michael Noonan as having the potential to save Ireland billions of euro. EUROZONE FINANCE MINISTERS have agreed to examine the possibility of extending the maturity of Ireland’s loans from one bailout facility in move which could save the country billions of euro. Finance Minister Michael Noonan said that any deal on the repayment of €17.7 billion that Ireland has received from the European Financial Stability Facility (EFSF) had the potential to “further enhance Ireland’s debt sustainability”. He said it would also facilitate the country’s hopes of returning to normal lending markets, exiting its €67.5 billion bailout programme agreed over two years ago. Technical details of extending repayment of the loans from eurozone member states will now be looked at by officials with a similar offer also made to Portugal. A report on a possible deal is expected in March. Speaking last night, Noonan said that extending loan repayments would mean that the National Treasury Management Agency (NTMA) would not have to borrow to repay the debt as quickly as current projected. He said that the savings would not be “huge amounts” but would be “significant” and said that it would be “a certain amount of billions”. Noonan said that exact amounts could not quantified until work has been done on a deal. The Minister also insisted that this would not impact on separate negotiations regarding a deal on the Anglo Irish Bank promissory note and the retrospective recapitalisation of Irish banks through the European Stability Mechanism (ESM). “They’re entirely separate issues, the negotiations on the promissory note is continuing and whatever may occur subsequently on the direct recapitalisation of banks by the ESM is a totally separate issue,” he told the media. As all European Union finance ministers are set to meet today Ireland will also make a request for the repayment of loans totalling €22.5 billion received from the European Financial Stability Mechanism (EFSM), a European Commission facility, to be extended along similar lines to that agreed on the EFSF. As Ireland holds the EU presidency, Noonan will chair the the meeting of European finance ministers today – Ecofin – with junior finance minister Brian Hayes representing Ireland. 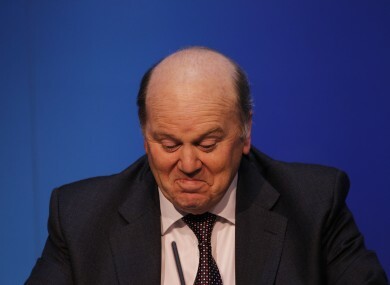 Email “Eurozone finance ministers agree to examine Ireland's loan repayments ”. Feedback on “Eurozone finance ministers agree to examine Ireland's loan repayments ”.